Congratulations to Jon Keyser, who just made the primary ballot by way of a court challenge. (See 9News: Jon Keyser makes primary ballot via court challenge) The following blog was posted just minutes before the news. 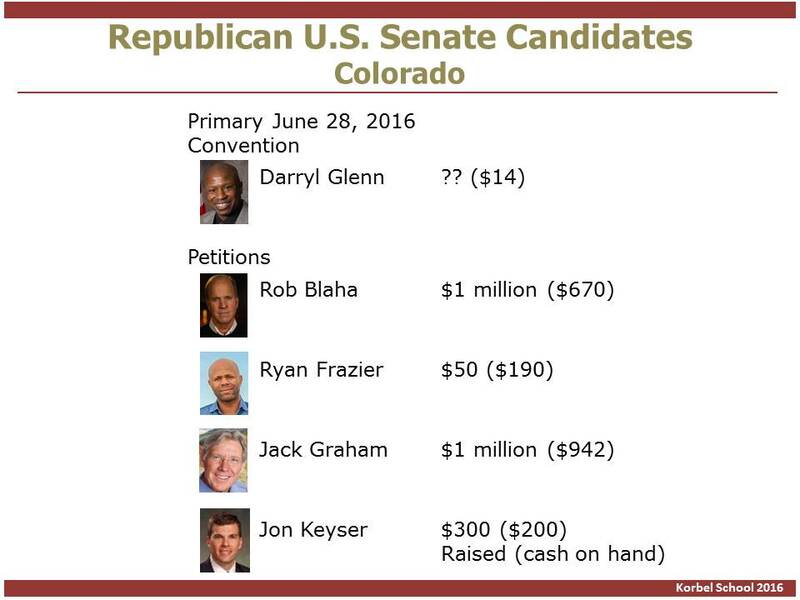 The Republican U.S. Senate primary is, as of today, a two-man race between Darryl Glenn, a county commissioner from El Paso with little money in the bank for the June 28 primary, and Jack Graham of Larimer County. Graham, a former CSU athletic director, has nearly $1 million in the bank. Three candidates failed to turn in sufficient petitions to make the ballot: Rob Blaha, Ryan Frazier and Jon Keyser. Keyser is protesting his exclusion since it only involved 86 signatures in the Third Congressional District. Is Graham now the frontrunner? How does he match up against the incumbent Michael Bennet? Is Trump the Presumptive Nominee? Major elements of the Republican power structure and the national commentariat are beginning to believe that Donald Trump, barring a self-induced debacle the next month, will have his 1,237 delegate votes after California or be so close as to make it possible for him to pick up a handful of uncommitted. What happened to change the widespread view that a contested convention was likely and that Trump would not win it? Wisconsin was the primary that produced the sanguine view of Trump facing a contested convention. The loss was mostly unexpected, combined with more than a week of bizarre Trumpisms on abortion and foreign policy. What happened to turn his campaign around? Even Trump realized he was in trouble, which is not easy given his exalted view of his “common sense” and off-the-cuff speaking talent. Paul Manafort brought in a team to focus on delegates and professionalize the campaign. Trump shut up. He stopped the long interviews. It was the Washington Post and New York Times interviews before Wisconsin that caused huge trouble with political and policy elites. He bought a teleprompter and got some speech writers. His son-in-law has had a positive influence on forcing Trump to do what his family has repeatedly requested – be more presidential. Finally, the next round of primaries was in his backyard where his celebrity status and politically incorrect rap is known and popular. It didn’t hurt that his main opponent, Ted Cruz, has no real base in New York or the region. His Texas “super conservatism” is simply not a New York value. Floyd Ciruli will handicap the U.S. presidential nomination and its effect on American foreign policy. He will discuss voter anger in America, citizen dissatisfaction with the global economy, and how politics in Europe affect the U.S. Ciruli believes the 2016 election will bring significant change to America and its foreign policy. Presenter: Floyd Ciruli, Colorado’s leading pollster and director of the Crossley Center for Public Opinion Research at the University of Denver. Floyd is a well-known political commentator, lecturer and blogger. The Ciruli seminar is one of eight that take on interesting and current topics from DU and other local experts. See flyer here. Regardless if they get their respective party’s nomination, Donald Trump and Bernie Sanders have already affected Colorado’s congressional elections. The Democratic super delegate controversy helped get Diana DeGette her first primary in 20 years. Gail Schwartz was strongly encouraged to run against well-positioned Republican incumbent Scott Tipton because Washington operatives believe Donald Trump (or Ted Cruz) could produce a Democratic tidal wave. Congressman Ken Buck helped engineer the Ted Cruz sweep of Colorado Convention delegates, but the group was challenged in Cleveland due to a Trump protest. Morgan Carroll’s fundraising is surging. Her tough race against incumbent Republican Mike Coffman now appears more competitive due to the Republicans’ bitter fight and weak prospects for president. Democratic perennial speaker-in-waiting Nancy Pelosi has targeted this seat for years. Caucus advocates extol the deliberative nature of the town hall meeting concept. Unfortunately, the ideal is far from the current reality; hence, the presidential caucus is on life support. The Democratic crowd overwhelmed the volunteers (120,000) and the Republicans more private event (60,000) was opaque, and when the results were announced nearly two months later, they were not accepted by many and immediately challenged. The Republican caucus delegates’ seating was challenged in the Cleveland Convention, not because the participants didn’t follow the rules, but because the process appeared so undemocratic. 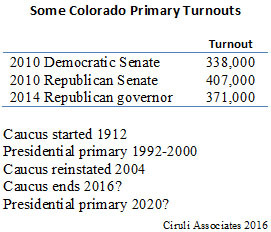 As polls show, people who participated in primaries expect the mass of voters should rule, not the small regular party-dominated events (see Colorado Caucus – A Republican Football). 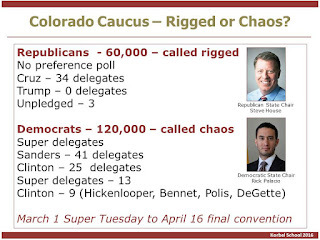 Colorado state primaries for governor (2010 and 2014) and Senate (2010) have attracted upwards of 40 percent of the parties’ membership whereas the caucus system is lucky to get 10 percent, and primary results are immediate and verifiable. Current primary proposals would also include Colorado’s one million plus unaffiliated voters as possible participants. The theoretical advantage of caucuses is that the party participants come together and deliberate, reflecting not just the passion or issue of the moment, but also party traditions and values and the desire to field a winning candidate. However, the caucus process is often overwhelmed by too many passionate participants or dominated by too few party insiders. The primary, which offers the democratic idea of mass participation in a transparent process, is hard to resist. 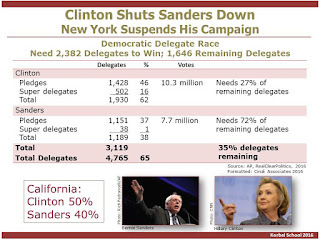 Bernie Sanders’s loss in New York brought the already remote possibility of victory to an end. He now would need 72 percent of the remaining delegates, and he’d be lucky given the demographics of the upcoming states and the Democratic proportional rule to get 50 percent of the remaining delegates. Arguably, he will continue to represent the leftist cause and his liberal constituents in Philadelphia, but he will not be the nominee, and if he doesn’t tone down the attack on Hillary Clinton’s credibility, he will be vulnerable to the charge of further damaging the Democratic ticket in November and purposely harming the first serious woman nominee. 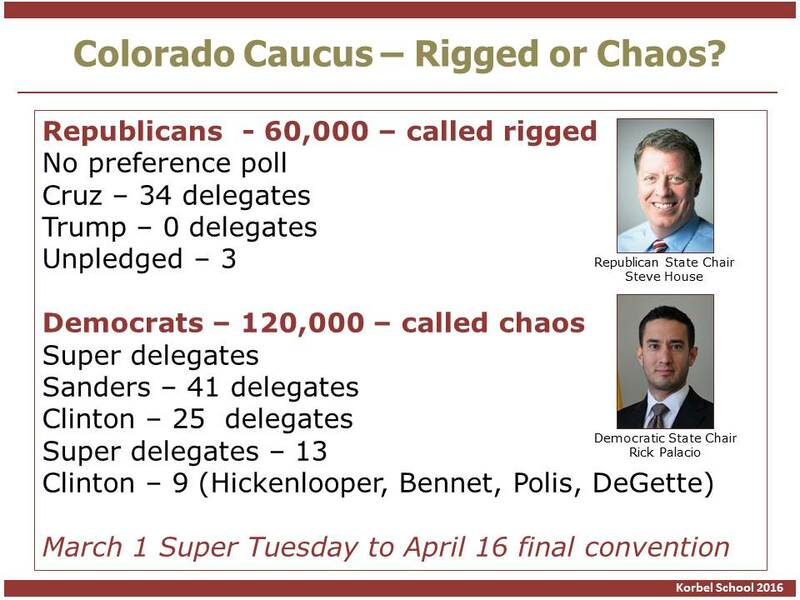 After a 16-year hiatus, the Colorado presidential primary is back. It took a highly contested presidential nomination and controversial caucus process to end the long dominance of the precinct caucus and state convention system. The Democrats, with their preference poll and battle between Hillary Clinton and Bernie Sanders, attracted more than 120,000 participants in a night that overwhelmed the caucus sites and the volunteers running them. Thousands showed up at some sites in the metro area, waited hours, and then only waved their support and left. Hardly the ideal caucus experience. The Republicans had the opposite experience. By abandoning the preference poll (mostly a beauty contest-type that previously didn’t bind delegates), only 60,000 Republicans turned out and the proceedings were dominated by party regulars and strong conservatives well organized by Ted Cruz. At the state convention, when it was clear Donald Trump would be shut out, the cries of a rigged process, a “no voter” primary started and are likely to continue to the Republican convention in Ohio. The credibility of the caucus is dead. 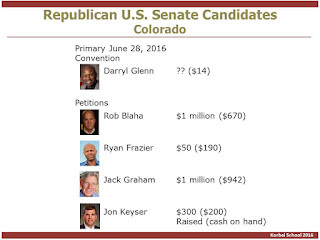 On June 28, 2016, Colorado Republicans will pick their senate candidates from up to five candidates, two of which are qualified – one by convention, Darryl Glenn, and one by petition, Jack Graham. Three more are waiting for petition signatures to be verified. Trump, who has used the Colorado procedures as a useful distraction in his continuing losses of delegates in final selections and as a part of his effective anti-establishment rhetoric in the New York primary, now promises to fight Colorado’s result – a sweep for Ted Cruz – at the Republican convention in July. Fights in the credentials committees of national conventions over the sitting of delegations takes place even in calmer years, but this promises to be a very interesting fight that could go to convention whether or not Trump gets the 1,237 majority he needs to avoid a second ballot. Unfortunately for the Republican National Chairman, opinion among Republican voters is not inclined to offer much maneuver room. Republican voters believe the results of participation in the primary events should decide the nomination, not the delegates on the convention floor. 62% say give nomination to candidate who got most votes in primaries; 54% say if Trump ahead, give it to him. 45% if denied, Trump should run as independent; 47% that’s unacceptable (WSJ/NBC News, 301 Republican primary voters). Barack Obama enters his last few months in office with the highest approval rating since early 2013 after his re-election. 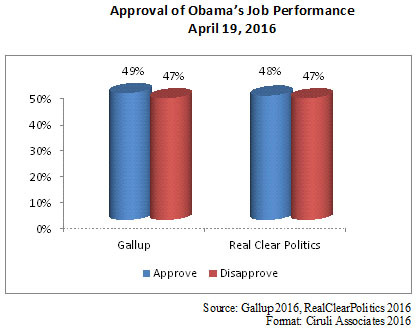 Beginning this year, Obama has frequently had an approval at 50 percent, with more Americans approving his job performance than disapproving. That is very good news for the Democratic nominee. Presidential approval, along with the direction and state of the economy, are considered the most powerful predictors in the success of extending a party’s control of the White House into a third term. Unfortunately for Democratic frontrunner Hillary Clinton, her favorability with the general public has hit a new low. 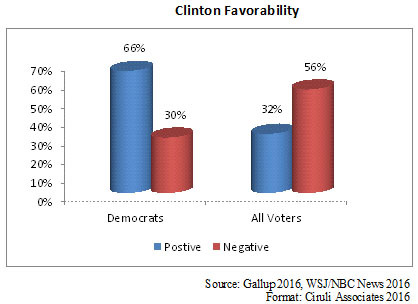 Only 32 percent have a favorable view of her according to the latest WSJ/NBC News poll. Even among Democrats and Democratic-leaning independents, Clinton’s favorability rating has declined perceptibly since November due to a barrage of criticism from Bernie Sanders and a string of primary and caucus losses (Gallup). Donald Trump, of course, is seen even more negatively, with 65 percent having an unfavorable view of him (WSJ/NBC News). A host of factors may be helping Obama’s approval, including the fact he’s not the target of Republican presidential candidates as they focus on each other, and he’s had some popular initiatives, including the trip to Cuba and his Supreme Court choice. The pick-up in the economy no doubt helps as does the stark contrast, especially for Democrats, as to what could succeed him. Dilma Rousseff, one of the world’s most high-profile women leaders, is on the verge of impeachment after just winning a hard fought presidential re-election in 2014. A high-level corruption scandal and a contracting commodity-based economy are fueling the opposition. In a new Datafolha poll (N2779, April 7-8), Brazilians indicated they favor impeachment (61%) and would like a do over in a new election (79%). An impeachment vote is due April 17 in the Lower House and the President appears vulnerable. Prime Minister David Cameron, fresh off a surprising parliamentary victory, is now in a fight to hold Britain in the European Union and keep his job. Polls show support to separate is strong and the current vote close. The June election largely depends on Cameron’s credibility, which has suffered due to the divisions in his own Conservative Party and recent revelations about offshore wealth. Brexit also benefits from ongoing criticism of Brussels and conservative opposition to the continent’s initiatives on gay rights and immigration. Cameron’s approval rating his dropped from his post re-election 50 percent to a rock bottom 34 percent (YouGov). If voters go against the EU, Cameron’s tenure is in doubt. 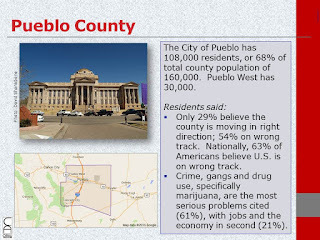 Pueblo leaders are moving to take on the crime and gang problems that have labeled the town a crime capital in the most prestigious papers in the nation and Colorado. 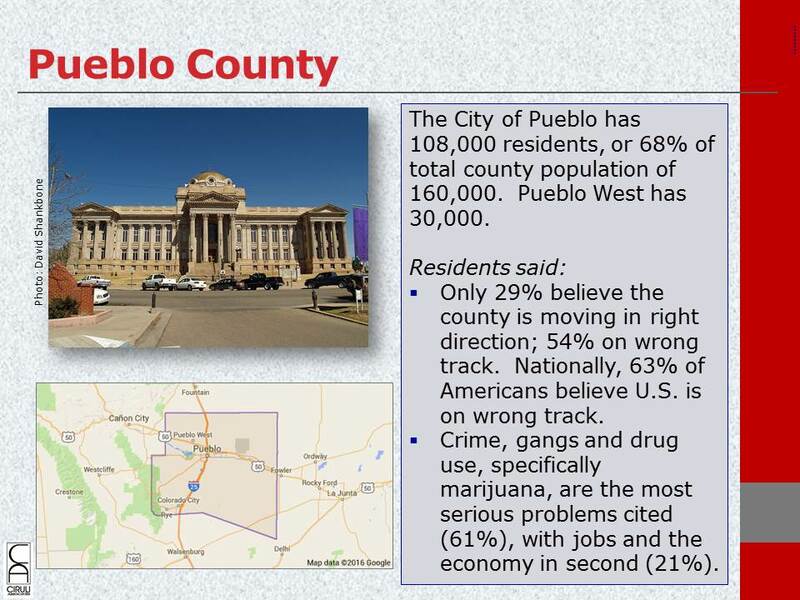 In the last month, the New York Times and Denver Post have published high-profile stories on Pueblo’s struggle with crime due to record-level murders and gang-related heroin trafficking. Adding money to police budgets through additional taxes and putting some limits on the burgeoning marijuana industry are two proposals local business and political leaders are examining. Donald Trump has been using the Colorado Republican delegate results, a near sweep by Ted Cruz, to reinforce his outsider anti-establishment position. It may help him in New York. As his home state and not Cruz-friendly territory, he should win it big (53% in latest polls). But there is a substantial backlash from knowledgeable individuals arguing that the Colorado system, while unique and hardly easy to navigate, is well-known by Republican political activists. Most of the failure to grab at least a few delegates is a reflection of Trump ignoring the process until it was too late. 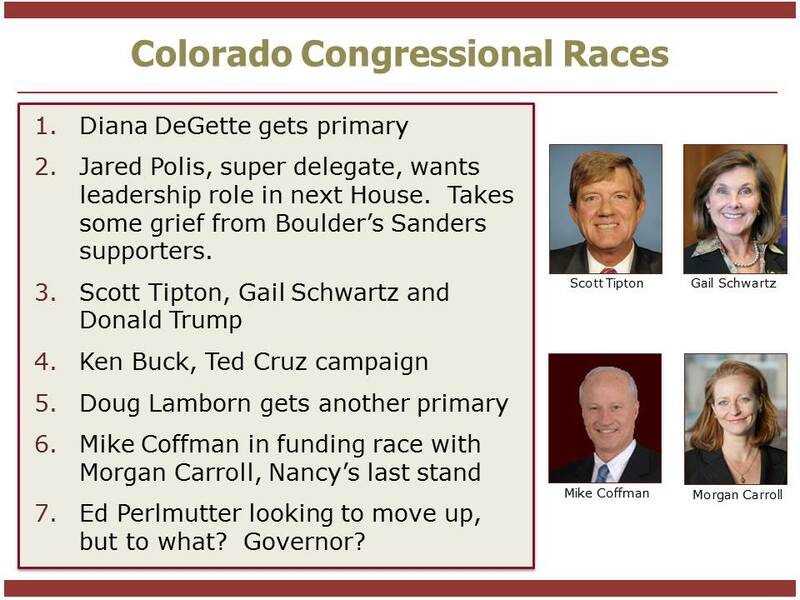 However, many Colorado Republicans, including numerous leaders, thought dropping the preference poll at caucus was a mistake (see blog Feb. 29 here). 9NEWS political expert Floyd Ciruli blamed the results on both the party and Trump himself. Ciruli said the state party made a major mistake last summer when they decided to cancel the statewide presidential preference poll slated for March. “By not having a preference poll, they disenfranchised thousands and thousands and those people today, they are angry. Are they going to vote for the eventual nominee if it’s not Donald Trump, who knows," he said. Ciruli also said Trump didn’t put much effort in Colorado, while Cruz established a strong ground game here. “Donald Trump clearly had no ground game. He didn’t understand the rules," Ciruli said. Trump plans to contest the results. Donald Trump rages against the “rigged,” “crooked” and “corrupt” system. Valerie Richardson in the Washington Times points out that his poor performance is also a product of his lack of political competence. 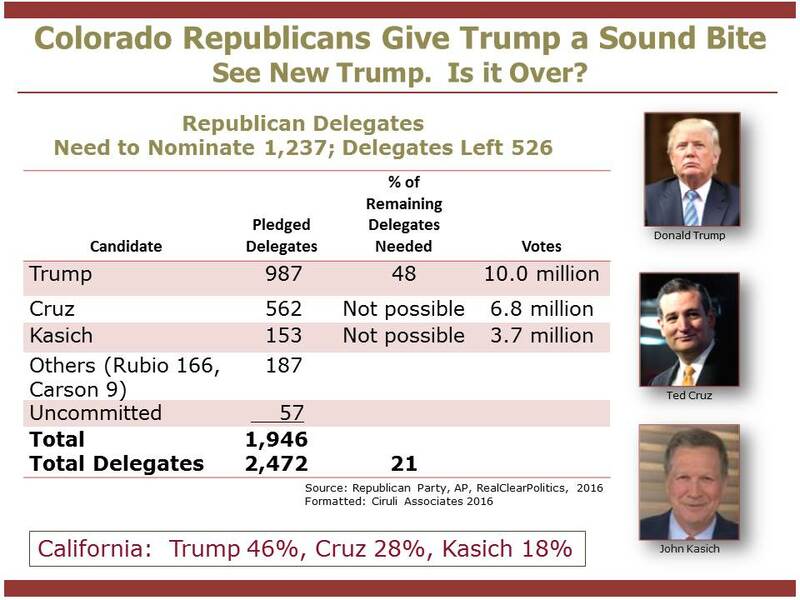 If Mr. Trump fails to accrue the needed majority of 1,237 delegates before the Republican National Convention, he can chalk it up to those sorts of lapses, said Denver-based political analyst Floyd Ciruli. 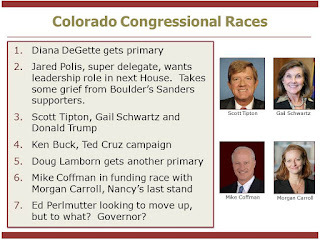 In August, however, the Colorado GOP decided not to hold a caucus preference poll after the 2012 shenanigans of presidential candidate Ron Paul supporters. Mr. Paul wound up with 25 percent of the convention delegates even though he captured less than 12 percent of the poll vote. That may have been a mistake, according to Mr. Ciruli. “The Republicans here made themselves vulnerable to this charge by not having any kind of a preference vote. Caucuses are hard enough to understand to start with,” he said. 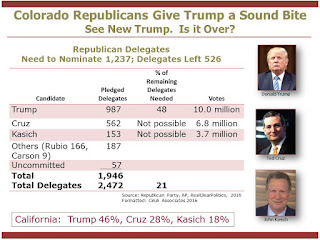 Although the main reason Donald Trump didn’t get any delegates in Colorado is the incompetence of his campaign (see blogs: 9KUSA – Four Reasons Cruz Leads in Colorado Pledged Delegates; Donald Trump Will Not be the Republican Nominee; Trump Coming to Colorado – Too Late), the Colorado Republican Party is receiving a firestorm of criticism for their foolish decision to forego a preference poll (see blog: Republicans Not Happy). The caucus system is now officially dead. Democrats mishandled the crowds on March 1 and Republicans tried to make it a private party. A presidential primary is a certainty. Representative Diana DeGette drew a primary challenger at the South High School First Congressional District convention last Saturday. It is her first primary since her election in 1996. In a convention solidly in Bernie Sanders’ presidential camp, DeGette, as a Clinton super delegate, tried to finesse it, but was called out and challenged. Although the candidate is purely symbolic and claims to be a global warming advocate, it shows the passion of the Sanders’ delegates. Also, primaries for long-serving incumbents are often a sign they should think about their next office or retirement. Schwartz, a recently term-limited State Senator who represented Aspen, Gunnison and the San Luis Valley on the Western Slope, was a hard campaigner and a prodigious fundraiser. It appears Minority Leader Nancy Pelosi and the Washington Democratic operatives see a Republican bloodbath coming, especially with Donald Trump as the nominee, and are slating their best candidates in even harder to win seats. Donald Trump believed his personality and a multi-candidate field would deliver him the nomination. News flash, his personal image is one of the most disliked in modern American presidential political history (post WWII), and the seventeen-candidate field is now down to four: Trump, Ted Cruz, John Kasich and unpledged delegates. Trump’s arrogance led him to believe he didn’t need any real preparation for close media scrutiny. “I read newspapers” and “have common sense” has not proven sufficient to answer questions on social issues, like abortion, or foreign policy issues, like nuclear arms and alliances. Being politically incorrect on immigration and terrorism didn’t seem to hurt him, but favoring nuclear proliferation, opposing American alliances and being clueless on abortion politics is finally driving down his support. The economy was his strength and his undisciplined campaign chatter on non-economic issues has been a major distraction. The loss of Wisconsin reinforces Trump’s difficulty of winning before the convention. Consistently 60 to 65 percent of the party is opposed to his nomination, and today, even more adamantly. A contested convention with possible multiple ballots is becoming a near certainty. Hence, his lack of convention delegate strategy is his most serious failing as it will doom his candidacy. Because most of the delegates to the Republican convention will be party regulars, they are not likely to support outsider Donald Trump on second and subsequent ballots. In a few states, like Colorado, which avoided a preference poll or primary, delegates are mostly either going to support Ted Cruz as the conservative who has worked for months to recruit delegates or they will remain unpledged. Most Republican delegates will be released after the first ballot in Cleveland and will not support Trump on later votes, both because he looks like a general election disaster and because he is an unpredictable maverick. 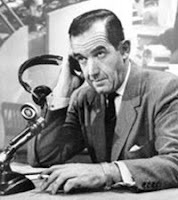 To paraphrase Edward R. Murrow: Good night Donald and good luck. The above table represents the best estimates in an ongoing process with many moving parts. A variety of sources were used to find the delegate numbers, with most credible sources reporting them. The candidates could add to their delegate totals by winning over delegates pledged to other candidates and those elected unpledged. 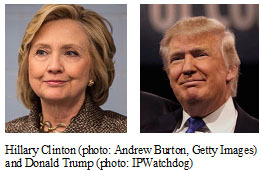 As discussed with Susan and Mike on KOA, it’s not generally recognized, but older Democratic Party regular Hillary Clinton and Republican outsider Donald Trump are drawing from similar constituencies in their respective parties. An analysis of primary exit polls show they both attract older voters and are losing the young, are supported by moderates, are in tough fights with their respective party extremes, and win the lion’s share of lower income and less educated voters. They are both opposed by better educated party elites. The candidates will have to expand off their base to broaden their appeal for the general election. But, Trump has the much tougher task. His record-high unfavorability leaves him handicapped to appeal to younger voters; conservatives; the establishment; and constituencies Clinton has a substantial lead with, women and minorities. Colorado news outlets are reporting Donald Trump will visit for the first week of April for the congressional delegate conventions that culminate in the state convention on Saturday, April 9. He’s too late. The Republican Party establishment and operatives for Ted Cruz have already locked up most of the delegates, if early reports hold up. 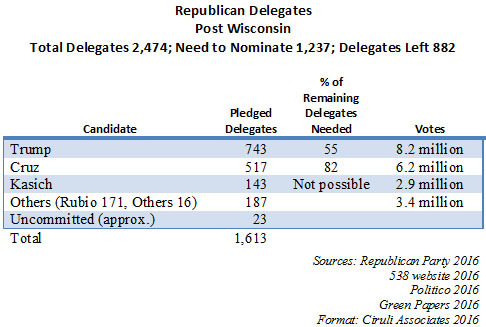 As reported last week on 9KUSA, early reports of state convention delegates show Cruz had the lion’s share of pledged delegates, but that the bulk of delegates (two-thirds of the 34 available) were remaining unpledged. It was assumed the 145 initiatives filed in 2014 would be a difficult record to break, but as of the filing deadline on March 25, 2016, 158 initiatives were filed for review and comment, with a mass of final filings the last few days. Many of the initiatives follow a new trend of multiple filings for a basic constitutional or statutory goal, with upwards of ten or more versions. Each version tests variants on the core theme, such as different tax levels for infrastructure advocates, different versions of TABOR changes and distances fracking is prohibited. Hence, it is likely if the initiatives pass legal muster (mostly a ballot language test related to two subjects), only one of each of the core concepts will be promoted by proponents. In 2014, most of the initiatives were never seriously going to find the 90,000 plus signatures needed for the ballot, and many proponents didn’t even try. They were just fishing for a local or national admirer who could supply money or passion. All the anti-fracking proposals were abandoned at the last minute, leaving only four initiatives on the ballot. Out of the entire effort, one rather innocuous change in public education-labor transparency passed. 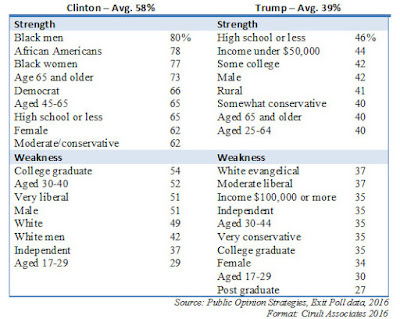 Exit polls from the Democratic and Republican primaries confirm the description of Hillary Clinton’s and Donald Trump’s strengths and weaknesses with their respective party voting blocs. There are differences, but also some similarities. Clinton’s position is much stronger in that she’s averaged 57 percent of the primary vote. Trump, in his multi-candidate contest, has only averaged 39 percent. In Clinton’s contest with Bernie Sanders, she’s attracting the African American voters and females. 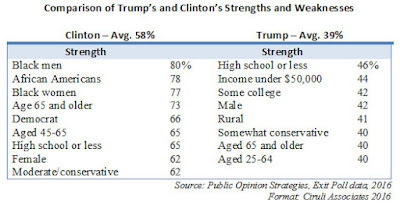 Trump by contrast is overperforming with White men. 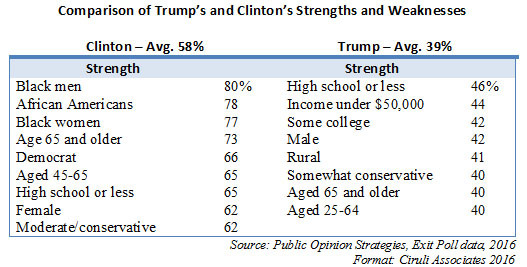 But within their contrasting camps, both do better with older voters and downscale voters with less education and income. And, they both attract moderates in their parties more than the extreme.